Facebook comments on team riding from Luke Murrell cost him $5K a heavy penalty for saying what many others thought but kept ot off social media. Interesting that the horse in question saddled up next at Kembla on 12th Nov in a C2 over 2000 stewards report noted "Change of tactics to be ridden with cover" and so it was ..........short priced favourite and always going well and bolted in...made no mistakes this day and no stable mates in contention this time. I could be wrong but I think Winx was his only g1 winner this season but with multiple G1 wins any trainer would be happy with. Should be some news on the ICE positive late tomorrow when the Inquiry resumes. Betcha Thinking is the horse has raced three times since the ICE positive the Inquiry starts on Friday...I doubt there'll be any penalty for Waller. The issue here is not that there will not be, should not be, any penalty for Chris Waller -- the issue, most likely, is about the self-serving promotion of the role of the stewards. At all stages of the swab-testing process it would have been open to the stewards to disclose the extent of the contamination -- how much 'ice' was detected and how likely it would be that such a reading would have any impact on a 500 kg horse. I recall observing an inquiry into the detection of 'heroin' in a swab -- and during the break I asked the 'chief swabber' whether the level detected was of any material consequence -- the answer was 'no'. Even so the 'case' proceeded to convict and impose a penalty -- subsequently set aside -- but eh obvious next step of declaring irrelevant readings below a threshold was not taken. One can only surmise that the laboratory capacity to detect a substance exceeds the mental capacity of the industry to avoid headline grabbing scams about what was found. The horse had traces of the drug in its urine....the question is how did it get there? Two previous cases one fined the other disqualified MvG opined on RSN words to the effect that circumstances were somewhat different to this case. The first ICE positive in Victoria around 15 months ago resulted in the horse being disqualified from the race it won while the trainer was found not to be culpable.....it was thought that the contamination occurred through a female stable hand who was suspected of being a drug user ......it was a miniscule amount...but there's no explanation as to how ICE which was detected in the urine sample got there. "The amount of methamphetamine involved was minuscule and could have come into the horse's system in any of a variety of ways. We also point out that the expert evidence is that such a minuscule amount of contamination could not have had any effect upon the performance of the horse." This decision briefly refers to one of Gai Waterhouse's runners returning a positive to coke.......you can bet Waller's brief will be all over these precedents tomorrow when his case is heard..
............ the problem here lies with stewards who see detected 'offences', of no possible material consequence, as 'headliners' illustrating their dedication to 'integrity' -- all the more so when a prominent stable is involved -- because this counters the 'false news' rumour mill that explains the success of some as blind-eye policing. The TAB punters have had enough of this nonsense -- any trainer deliberately using detectable drugs should get-off on the basis of insanity. What TAB punters want is some intelligent application of stewards thinking to finding the reasons why some punters anticipated that some runners would shorten -- and win -- and others would ease -- sometimes markedly -- and lose well beaten. Those that got on a winner today but stayed well away last week may have some interesting explanations about who told them what and when - put differently if a stable smokes one in, that is considered part of the game -- but when a stable gives some insiders a leg up it takes the game into territory that is conspiratorial and akin to punishable insider trading. Tell me one instance of the stewards conducting a 'review of the betting' that resulted in a prosecution for an offence recognized in the criminal code. Thee racing industry is playing with the policing of integrity. ..........and, it is well beyond time that stewards had the balls to say , on Friday, that a scheduled race on Saturday is not only so overcrowded to deny a fair race, but stacked with horses that have no entitlement to be participating because they have no reasonable chance of placing. Where are the stewards with a sense of professional independence? Some evidence from overseas on ICE contamination cases. You have got to hand it to RacingNSW their investigation left no stone unturned in an effort to establish how Betcha Thinking returned a positive to meth but the exhaustive interviews and testing did not disclose how the substance entered the horse's system...the outcome Waller found guilty of the presentation rule fined a whopping $30K and the horse disqualified from its second placing. I can see no sense in convicting a national asset of an offence of no consequence and imposing a substantial fine. ......the credibility of RNSW is only diminished ... and it is still precluding another national asset from riding in races in NSW. What I found remarkable was that the testing performed under the auspices of Racing NSW revealed no positives to meth. Evidence today was provided by Mr Waller in respect to workplace drug testing that was conducted by Chris Waller Racing on 16, 23, 24 and 30 November 2016, whereby urine and hair samples were collected. Of the 67 samples collected during this period, one staff member tested positive to methylamphetamine. It was established that this staff member had no direct access to Betcha Thinking during the relevant period and it was extremely unlikely to be the cause of the finding of methylamphetamine in the Betcha Thinking sample, particularly having regard to the extensive detection period of methylamphetamine in hair samples. I think it is a credit to his integrity that he undertook his own testing and publicly revealed the results. As Arsenal says, it was a pretty exhaustive inquiry by Racing NSW, and completed in 5 weeks. How long have some other inquiries around the country been going on? Racing NSW seems to be way ahead of the pack in dealing with matters presented before them, and the penalty applied seems commensurate with the "crime" in spite of the rantings in social media. I had a scroll through g1 winners for the season and he has a very quiet season with only 3 wins with the great Winx. Same time last year he had 10. I am not sure if he has the quality to hit double figures but then again if I had a record like his training, I would not be complaining too much. Brent Zerafa reports that the NSW RAT confirmed the conviction but reduced the penalty from $30K to a more realistic/affordable $5K the reasons for decision are not yet publicly available. The mighty mare - ‘officially’ the world’s best on turf in 2016 - stepped out for the first time in 2017 at Randwick yesterday. The queen, Winx, had been kept waiting as this meeting and her race - the G2 Apollo Stakes - was postponed from Saturday, when Sydney’s temperatures exceeded 40 degrees in places. The wait was worth it. She won her 14th consecutive race, matching a winning sequence put together by Australia’s most revered racehorse some 90 years ago. That’s a long time ago. But just about everybody, kids included, in this country knows Phar Lap. Now they all know Winx. The Australian Turf Club switched the race (over 1400 metres) from 3.10 pm on the holiday Saturday to 5.40 pm on the workday Monday to ensure that as many as possible could see her post work and school. That plan worked with the crowd swelling, after 5 pm, by perhaps 2,000, despite peak-hour traffic and a temperature that was still well and truly high enough to justify a trip to the beach, which is just ten minutes from Randwick. Hundreds gathered around her stall an hour or so before the race, but there wasn’t much to see, with trainer Chris Waller preferring to keep her away from fuss for most of the afternoon. “Where is she? He’s a funny one that Waller,” asks one punter. She was out the back, in the shade, behind the bank of stables where the saddling up is done. Nobody’s backing her each way. She’s $1.14 or 1-7. The souvenir tickets are win only. The second favourite, Hartnell, strolls right past. The only one of her rivals to do so. That’s the nearest he’ll get to her this afternoon. Dibayani digs his toes in and refuse to leave the saddling area. “I think he knows who he’s racing,” says his handler. Dibyani is starting to lose the plot (as he can do) and Winx is now the only horse behind him. She’s not bothered. Head down, ambling and eventually she makes her way to the parade ring. “Let’s just hope she has a trouble-free run,” Waller says. A huge throng, relative to the overall crowd number, gathers for the parade at the rather grandly named Theatre of the Horse. It’s the mounting yard. Many are videoing the mare in her preliminaries including some you might have thought far too cynical to be so moved - like Mark Richards, former jockey and TV presenter and Hong Kong Jockey Club yearling buyer. She is clearly now one of those horses who’s become public property. 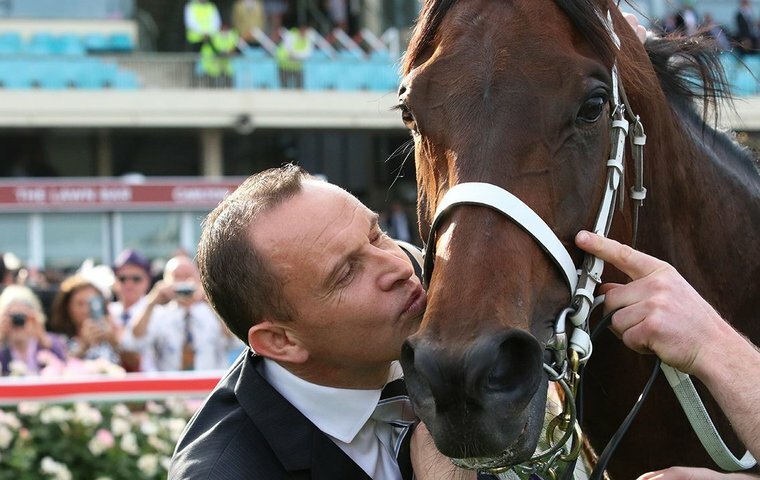 Even casual fans probably know that Chris Waller was, like Phar Lap, born in New Zealand. They know he’s the number one man; they know he gets a bit emotional on race-day and they expect him to ensure that this mare keeps winning. That’s a bit of pressure, and the trainer later spoke of the intensity of expectation that came with handling the mare, likening it to that faced by a premiership-winning football coach. Another 48 hours potentially to fret in this case, but Waller remained unflappable ... enough. Those close to the coalface say he has been volatile, in the past, in the lead-up to major races, but yesterday he seemed as at ease as anybody could be in the situation. Winx wins effortlessly (YouTube video above), finishing 2.75 lengths clear of Hartnell now that the walking has turned to racing. Four lengths further back was Endless Drama (now also with Waller but formerly based in the UK where his CV included a G1 Lockinge third and taking Gleneagles to less than a length in the Irish 2000 Guineas. It was a bad day for Hartnell’s owners, Godolphin. Jockey James Doyle had a nasty fall in the following race on their 4-year-old mare Pearls. Godolphin confirmed later that Pearls, a G3-winning daughter of Exceed And Excel, had to be put down after suffering multiple, inoperable shoulder injuries. Doyle, meanwhile, is out of action for up to four weeks after sustaining a fracture to his right hand in the fall. This is tough for Godolphin, who drafted in Doyle to replace the suspended James McDonald. Winx is likely to run next in the G1 $600,000 Chipping Norton Stakes (1600m) at Randwick on February 25. Her main autumn goal is the $4 million Queen Elizabeth Stakes (2000m) at Randwick on April 8. Waller says “there’s improvement come” in terms of fitness, as trainers are inclined to say when horses return from spell. But if he’s right, then the winning sequence looks as though it’s rolling on. Waller has been the dominant training figure in Australia since 2010, from his Sydney base. Challenged only, in the last couple of years, by Darren Weir from Victoria. Just ten years ago, he was practically unknown. He’d moved from New Zealand to try his luck. He hadn’t trained a G1 winner. Now he has 65. He is also the fourth-ranked trainer in the world, and, of course, #1 in the Australian list. He has six consecutive Sydney trainers premierships to his name. Last season, despite a reduction in the number of city race meetings, he trained a record 169 metropolitan winners, who earned A$19 million prize money. You could say his dominance was Bradman-esque (referring to the cricketer Don Bradman, widely regarded as the greatest batsman ever) . His tally was more than twice that of runner-up John O’Shea, who prepares the Godolphin team, and O’Shea’s season was excellent by any measure other than comparison with Waller. A tally of 29 Group 1 winners in the two seasons, before the current racing year, is Aidan O’Brien-esque. And 23 of the 29 were provided by horses other than Winx. Recognising a void in the staying ranks in Australia and also securing the support of major owner Bob Ingham (his Ingram Racing is now #34 in the world owner’s standings) were probably the two key drivers to Waller’s success. His success with inexpensive staying horses acquired from Europe gained him recognition and popularity with prospective owners across the board. He seized not only on the fact that the local staying horses were limited but also that few of his rivals trainer were inclined to focus on them in a county where speed is king. And he was buying before the hordes followed and prices escalated. Ingham supported Waller with a large number of yearlings from 2008 after selling his Woodlands Stud racing and breeding operation to Sheikh Mohammed’s Darley operation (read Godolphin) that year for a reported $500 million. “It is a privilege to train for Mr Ingham, and I am also extremely thankful to all my other owners in the stable who have helped us to become what we are today,” said Waller, who is ever the diplomat, constantly thanking his supporters and acknowledging the efforts of his staff. Waller started his racing career in Foxton (New Zealand) with trainer Paddy Busuttin. He was travelling foreman for Busuttin and had an association with stable veteran Castletown, who ran third in the 1992 Melbourne Cup. He then took over Busuttin’s stables when Busuttin moved to Singapore. He won with the first horse he shipped from New Zealand to run in Sydney, and the rest is history. He began permanent operations at Rosehill (Sydney) with four horses in his care and now has more than 120 in work and many more on the books. “I had four winners in my first year, then eight, then ten, 16, 40 - and we’ve grown from there,” Waller says. And not bad for a bloke who says: “I came across with no money and a credit card with about a 10-grand limit that was maxed out. I found an application for another one and maxed it out again. Waller’s cheap imports won numerous Saturday and midweek staying races before he upped the ante and secured imports, including My Kingdom Of Fife, who won major races. My Kingdom Of Fife, bought from Queen Elizabeth, won the race named in her honour at Royal Randwick in 2011. It was the first G1 win for Waller with a horse he’d secured from overseas. The Queen Elizabeth Stakes, then worth $500,000 and now with a $4 million purse, is the race firmly on Winx’s agenda this year. It’s the race she bypassed last year when Waller was happy to put her welfare ahead of the money. “She’d just had enough after she’d won the Doncaster and had to back up a week later. It wasn’t the right thing to do,” he says. This year’s edition looks to be at her mercy after yesterday’s performance. Omei Sword....................99 Barred 3 months. Other than Winx, he has had no other G1 winners this season. Mind you she more than makes up for it but it will be of some concern for him as his depth has been extensive for the past few seasons. Next few weeks could make him a bit happier.. I am an admirer of Waller but take away Winx and he is struggling for individual G1 winners. Other than Foxplay and Egg Tart, he has quite a few favourites in last 18 months but has not materialised in the G1 races. His stayers seem to be below the top G1 horses if the Metrop is an indication. I could be wrong but I can't see him challenge for the big Cups especially when you factor the o/s horses in. After watching some recent Sydney meetings, it is hard to back a Waller runner at times when he has another or multiples as the longer odds runs better than the shorter ones. Congratulations to Chris Waller for being inducted into the Hall Of Fame. On his web site is a summary of what he has achieved so far. trained 81 Group 1 winners and has climbed to seventh on the all-time list — with a bullet. and could even break the 200-win barrier, an unthinkable achievement until now. trainers’ title for a record sixth consecutive year. own national record of $30.2m set in 2015-16.
catch them up,’’ Waller said. I'm off the punt so not talking through "my kick"
The McKell Cup does have a history as I remember and one of the hurdles punters face was on display here. There is no doubt that Richard of Yorke was only there to bring down Ecuador and set the race up for the heavily backed Naval Warfare. Bad luck for the backers of Richard of Yorke....you unfortunately lost your money when the plan was hatched. Some comeuppance for whoever planned it because Destiny's Kiss, the big drifter, was too good. Who was the last Waller horse to build a picket fence ? Anyone who had doubts that team riding is perfectly acceptable these days would only have to watch the Hill Stakes yesterday for confirmation. Here we have the "best jockey in the world" running 4th, one out and one back in probably what could be described as the most favoured spot. The stable obviously thought that Egg Tart was a pretty good thing and just needed a solid pace so off goes "Hughie" before the 1000 metres on Who Shot The Barman to ensure that there was no loafing and basically giving his mount no chance. Bad luck there fellows because it turned out that Egg Tart was only the 3rd best stayer.......I've always felt she needs a bit of give in the ground but what would I know. Bowman's excuse was that he wanted to make sure his mount had a solid test so I suppose we could all say he certainly achieved that because it looked like a gut buster.......ok said the stewards. It's a wonder Gai Waterhouse is not complaining bitterly about the tactics that Waller employs with his multiple runners in Sydney races. Forever the Waterhouse horses were able to bowl along in front at an acceptable pace and then be able to kick away from the opposition and win. Now Waller will often have one of his put pressure on the Waterhouse leader and the horse is forced to travel quicker than they are comfortable with and be unable to kick clear. Consequently in recent years Waterhouse is getting nowhere near the winners she used to have. Sure she has less horses than she used to but it still a large very large stable with almost all them being ridden the same way. I was at the races on Saturday and the wind factor has to be taken into account. Nearly all the leaders collapsed including Redzel. It was very windy and it was an excellent tail wind but horses were running into it before the straight. Waller would be annoyed with Fiesta and D’Argento losing in photos as most including me at the track thought the jockeys went too early especially after the early races. Unfortunately Waller and Weir have too many runners in races. I am not defending them but anywhere where you may have more than one runner questions will always be asked especially if the 2nd favoured runner wins. Reality is the % of this would probably be lower than the favoured runner finishing ahead. Ace High was too classy but he usually sits near the lead and the Waller runner would have taken the edge off him. Ace High is a very good stayer and likes the pace so it really did work out well.